Capturing the hearts of many, the Komodo National Park in Labuan Bajo, Flores, shines as one of the brightest pearl of Indonesia. Worldwide travelers were lured with the pure beauty, embarking on multiple days of Komodo trip to explore the region. This UNESCO-protected park boats a stunning landscape with fantastic scenery that was blessed by Mother of Nature. Dozen of rolling hills rise from aquamarine water, flaunting jagged texture that emits raw Jurassic park impression. Rounding the islands is endless fresh clean sea, which openness will enchant anyone’s mind with inevitable relaxing feeling. Well, it’s easy to feel a world away when you are in a Komodo trip. The pure wildness of this region doubled up with tranquil vibe of the ‘lost world’ make it just right when you want to get alone by yourself. Because, you know, sometimes we just don’t want to run into anyone and just think about life—and immerse to nature’s best creation. While some of the good spot in Komodo has take their (well deserved) popularity, some still remains in secrets. 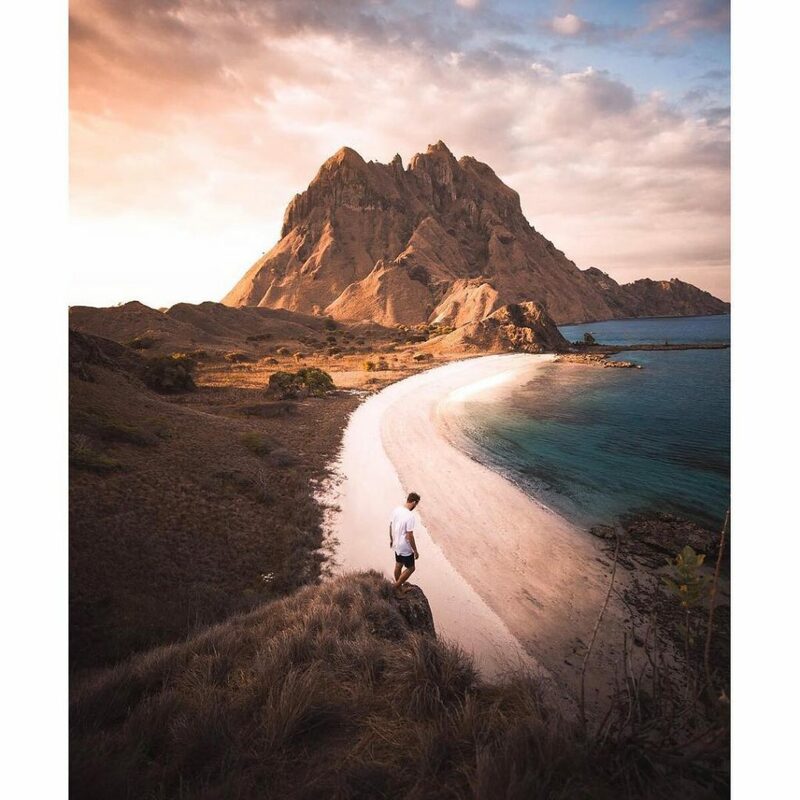 Behold, below are five best spot in Komodo that were just perfect to get alone, take pre wedding pictures, share intimate stories with life partner, or simply lets the mind wander. Most people come to the hot and rocky Padar Island for the peak view. Yes, that phenomenal hilltop you see everywhere in social media. A gorgeous hill squeezed by three multicoloured bays with aerial landscape in the background. The highest peak in the island where you can see 360º panoramic scenery of the whole Komodo landscape. As you has expected, the top hill can be a bit congested by tourist—most probably your own tour companions. The island, however, prized numerous charming spots if you are willing to look further. Move a bit on the side of the phenomenal spot, cause the hillside is not short on amazing view. There are acres and acres of areas behind the bushes where you can be away from all tourist and busy photographers. Just you alone, surrounded by swaying savannah, staring at the beautiful bays beneath. You will never really get the definition of wavy hills until you get into Gili Lawa. Any hillside on this tiny island is perfect for a moment to sit down and contemplate about life. Especially in moment before sunrise, when the island is gleaming red from the creeping sun, and the sky is constantly change with pinkish and purplish hue. Do you know that THAT famous Pink Beach is not the only pink beach in the region? Thanks to the presence of red corals, Komodo region has numerous rosy tinted beaches. The best Komodo trip leader knows hidden pink beach with less tourists around. The blend of rosy sands with bright turquoise water is a perfect set to escape into illusion of wonderland. Feeling not enough place to fulfil the gap in your soul? Worry not, we’ll be back to hidden exploration in another episode. Just stay tuned!